elaborating on the Prairie style, Wright moved on. 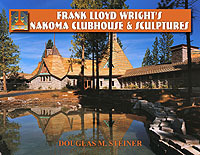 Wright designs can be described, analyzed, explored and studied in so many ways. What we would like to touch on are the details. Whether it is the details of his stained glass windows and fixtures, to his perforated wood cut light screens to his mitered glass corners, his details are ingenious. I am always overwhelmed when I see the complexity of the Dana Butterfly light fixture. His imaginative use of material and space. Doors that open outward. Cantilevered roofs. Corner doors that when opened, remove corners. His details are endless. Anatomy Of A Design "March Balloons"
Furniture of the Nakoma Clubhouse.